0.7mm Sterling Silver Crimpable End Caps 5 pairs. 1.4mm Sterling Silver Crimpable Cord Ends 5 pairs. 2mm Sterling Silver Crimpable Cord Ends 2 pairs. 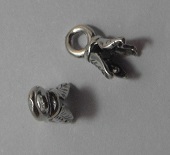 2mm Sterling Silver Cord Pinch Ends 1 pair. Sterling Silver Single Cup Bead Tip with Loop 5 pairs.